Hugo Kohl has been interested in art and design since he was a child. Twenty-five years ago, Kohl turned his passion into a career. 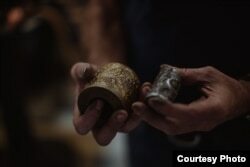 And over the years, he developed his own style of vintage jewelry using the same techniques as industrial revolution artisans at the end of the 18th century. Hugo Kohl has been interested in art and design since he was a child. In college, he studied finance, but also took several jewelry-making classes to satisfy his curiosity about this form of art and the history behind it. Upon his graduation, he started a career in financing, but after six weeks he quit to pursue his passion. Over the last 25 years, Kohl has developed his own style of vintage jewelry using the same techniques as industrial revolution artisans at the end of the 18th century. Hugo Kohl’s Museum of American Jewelry Design and Manufacturing in Harrisonburg, Virginia, is part museum, part workshop and part showroom. Visitors can buy handmade antique-style jewelry, and also watch the artist create them, using vintage machines. These machines were made before electricity and are literally man-powered as artisans have to use physical power to press the design on the metal. In reproducing these old designs, Kohl has revived a centuries-old technique for jewelry-making, called die strike or die roll. Kohl creates these details using thousands of 3-D molds he collected over more than two decades. He acquired one collection in Providence, Rhode Island, which was the jewelry making capital of the world at the start of the Industrial Revolution. He says there is an interesting story behind this collection. In 1993, while on tour of a vintage jewelry machinery warehouse, Kohl noticed workers cleaning up the debris of a nearby collapsed building. Those items that were about to be sold as scrap metal were part of a collection of antique, hand-engraved jewelry molds that dated to the late 1800s and early 1900s. James Madison University Art Professor Cole Welter says rescuing these pieces was Kohl's first step towards reviving the art of vintage jewelry making. Artist Kohl says his fascination with Industrial Revolution age jewelry goes beyond its artistic beauty. This industry, he says, started a social shift in America. Before the Industrial Age, only wealthy, elite people had the means to commission a goldsmith to hand-craft a ring or brooch or other piece of jewelry. This was extremely expensive, not something that ordinary people could afford. That’s also when the American cultural symbols were exported to the world. Art Professor Welter says he’s happy that Kohl is passing his passion and the secrets of his craft to people who visit his museum and workshop. And to customers like Sarah Brown, it’s nice to own part of the American heritage. And Hugo Kohl enjoys bringing those stories to life.